I ran for an At-Large position on the USATT Board. So why did I running? For 38 years I've watched as USATT floundered along with misguided and short-term thinking. Our membership of about 8000 is a round-off error compared to other sports and table tennis overseas - and we accept this as the norm. As a member of the USATT Board I will do whatever is necessary to change this thinking. Anyone who knows me knows I'm a doer, and I will do whatever I can to get these things done. Below are five issues I will focus on, my plans on twelve other issues, and info on my background. I want to focus on Progressive Issues - see my March 19 blog on this. None of these things are set in stone - if someone shows me a better way to reach the same goals, I'll go with that. =>The Goal: Dramatically increase USATT membership. We need to create a prototype regional team league that can spread nationwide, region by region. Right now anyone wanting to create such a league has to start from scratch. In Europe, the paid league memberships are measured in the hundreds of thousands. We need to study how the German leagues (600,000 paid members, overwhelmingly league members) and others were created and grew, and how other sports in the U.S. developed in this way, such as tennis (700,000 members, also overwhelmingly league members) and bowling (over two million, also overwhelmingly league members). Then design and create a USA league system for table tennis. =>The Goal: Dramatically increase membership by organizing on the local level. The country is too big to have everything run by one centralized group. Model this on tennis or the regional systems all over Europe. (Some larger states might have multiple associations.) These State or Regional Associations would focus on developing clubs, leagues, tournaments, coaching, and junior programs in their region. We start by recruiting USA state directors. =>The Goal: Large numbers of coaches, training centers, and junior & adult programs. This leads to large numbers of juniors and adult players. The Academy would expand on the current ITTF Program. Since the coaches pay for their training (as they do in the ITTF program and in other sports), the system pays for itself. The focus would be on both technical training and on recruiting and training coaches to be professional coaches - how to attract students, set up and run programs, create junior programs, etc. =>The Goal: Attract players, spectators, TV, and sponsors to our sport. We need to find permanent homes for the Open and Nationals, and let the local TT community develop and market them into big properties, like tennis and other sports did with their major events. =>The Goal: For top USA players to make a living playing professionally. We need to bring in an entrepreneurial leader to create an independent USA Professional TT Players Association. He would focus on creating a professional league or circuit, and bring in local & national sponsorship money for each event to turn table tennis into a money and TV sport. (He'd be paid primarily via commissions, though USATT would need to put in seed money.) This could grow out of the current NA Tour. A possible model is tennis, where there is a partnership between USTA and the ATP (the professional group). ​I'd like to focus on the five issues I've blogged about above. However, there are a lot of other important issues. Some might be just as important as the "Big Five," but as I've also blogged about, I want to focus on progressive issues that develop the sport, and I didn't want to have 17 main issues. That would be a shopping list. However, here are twelve other issues I'd like to take care of. Here they are, in no particular order. 2.06.04: "From the start of service until it is struck, the ball … shall not be hidden from the receiver [, or the net or the area above the net,] by the server or his or her doubles partner or by anything they wear or carry." Rules changes and the plastic ball. I'm not interested in more rules and equipment changes, other than fixing the hidden serve rule (addendum: and the problem with boosting). I'd be very hesitant on any others - I'm tired of rule changes. Aren't you? However, I am going to look into the problems with the new plastic ball - the ITTF jumped the gun on this. They shouldn't have made the change until the balls were high quality, standardized, and training balls were available. USATT Advisory Committees. A few years ago most of the USATT committees had the word "Advisory" added to their names, which emphasized that they are only advisory rather than action committees. That was a mistake. We need committees that get things done, not just sit back and advise. Committee Chairs. Too often committees are chaired by the first person who volunteers. We need to do searches and recruit the right candidate for each. I've seen times where a committee chair was decided like Jeopardy - whoever hit the buzzer first (i.e. raised their hand) got the position. Additionally, task force committees need to have deadlines set up for when they'll report back. Far too often these task forces are set up and never even meet, or if they do meet, nothing gets done and they are forgotten, and become just another inactive committee on the USATT committee page. NCAA recognition. I want to work with NCTTA on this. Here's some info on this. I blogged about this on November 18. Fix rating system. Too much to go into here. To start with we need a USATT Ratings Committee. We don't have one. Publish USA citizens ranking lists. This was actually required by a past USATT board vote that's long since been forgotten. Too often U.S. players are buried in the rankings behind foreign players. We need both an open listing and a citizens listing. U.S. Open and U.S. Nationals info. The dates and location of these events should be available at least one year in advance. The U.S. Open Tennis Championships the next two years will be on Aug. 31-Sept. 13, 2015, and Aug. 29-Sept. 12, 2016, at Flushing Meadows, NY. Where and when will the 2015 U.S. Open and Nationals Table Tennis Championships be held? We don't know yet. Many people need this info far enough in advance so they can schedule for it. Also, by getting the info out way in advance, players begin thinking about it, and are more likely to attend. Let members get on the USATT ballot by petition. It used to be that USATT members could get on the ballot with 150 signatures. That was changed a few years ago - now the entire ballot is chosen by the USATT Nominating and Governance Committee (NGC). We need to allow others on the ballot with the 150 signatures (from adult USATT members), and schedule the election so they can get these signatures during the Thanksgiving weekend (where there are major team tournaments), as they used to schedule it. There have been a pair of half-hearted attempts to fix this. At the June 2014 meeting at the U.S. Open the USATT Board voted unanimously to "recommend" that the NGC place "all eligible candidates on the ballot." (The NGC didn't act on this.) At the October board meeting Mike Babuin moved that "…all qualified candidates securing the 25 requisite number of signatures shall be placed on the election ballot." However, this standard is too low, and it didn't get a second. If I'm on the board, I'll move that candidates be placed on the ballot with 150 signatures, and that the election be timed so they can do this during the Thanksgiving weekend. Also, the USATT Club Representative is currently an appointed position. I'd like to see this position get voted on by clubs. There's also been talk of having a Coach Representative - I'm all for it! Change USATT's Mission Statement. Here is our current bureaucratic shopping list mission statement, followed by the mission statement of the U.S. Tennis Association. I like theirs, and would like to quote the table tennis version of it regularly at USATT board meetings. It needs to be the driving force behind everything we do. 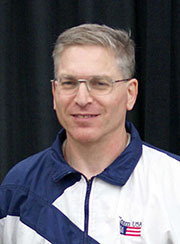 "The Mission of the USATT shall be to enable United States athletes to achieve sustained competitive excellence in Olympic/Paralympic, Pan American or Para Pan American Games, and other international competitions, and to promote and grow the sport of Table Tennis in the United States, while creating a lasting value for our members." "To Promote and Develop the Growth of Tennis." Here is a rundown of my background. I hope I can count on your vote! There's a lot more about me on my other table tennis page!